That is a powerful story ... very encouraging! I've just started a topic on daily exercise to encourage us to get out there -- and also to keep us accountable. I'd love to have someone with your dedication and passion for exercise along for the ride -- I surely could use an excuse buster! A truly inspiring story! The Ironman is a great accomplishment, and to do so as an asthma sufferer is just so amazing! It is so great to see all the crowd behind you, cheering you on and supporting your efforts. Way to go Cathy way to #TackleAsthma! Wow! that is an amazing story! Thank you for sharing it! I am a life-long asthma sufferer. I have nearly lost my life more times that I can recall from this condition. And yet, I have found ways to maintain my illness through nutrition and a healthy lifestyle, which in turns allows me to exercise more, which in turn, improves my condition. I still have seasonal and infection (sinus) triggers that have a big impact and I get very ill occasionally. But when I am healthy, I take full advantage. 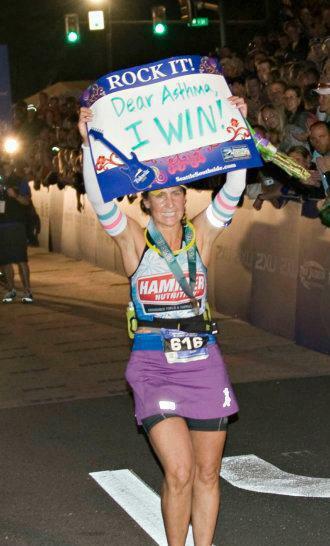 On this day, June 26th, 2012, I completed an Ironman Triathlon. That is, a 2.4 mile swim, a 112 mile bike ride, and then I ran a marathon (26.2 miles), all in one day. I was the last finisher, which in itself is a statement. I was literally the one athlete out of 2200 who exercised for the longest period of time that day. I made it, I conquered it, I tackled asthma and destroyed it that day. The year before, I attempted the race and was the first one in the medical tent as I was in the midst of a long asthma episode. To finish the following year with thousands of people cheering me on was far beyond my expectations. NEVER. EVER. GIVE. UP. Here is a link to the finish video at the intense finish line where i missed the cutoff by 23 seconds.....but watch what happens next! https://www.youtube.com/watch?v=ndY9xptZI9w Read about my journey and how I maintain my illness here: www.bringiton23.com. That IS rockin' it! Great to have you on board!